Wibrain i1 news and review links. One of the more easy-to-use UMPCs. 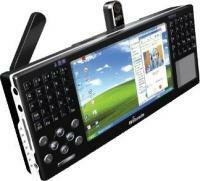 The touch-pointer and keyboard help to make the learning curve short. Fantastic screen and very good value. Not the most attractive of UMPCs but one of the more usable ones. The touch-pointer and keyboard help to make the learning curve short. Some fan noise. Fantastic screen. Not the most attractive of UMPCs but one of the more usable ones. The touch-pointer and keyboard help to make the learning curve short and the 1.2Ghz processor works well with Windows XP Home. Some fan noise. Fantastic screen. Looks good. Looks expensive! No keyboard could put some people off.